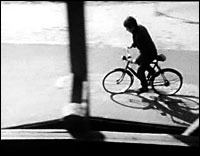 In the early 1960s, armed with £65 and a Bolex 16mm cine-camera that he had borrowed from the Royal College of Art, Ridley Scott shot his first film, Boy and Bicycle . Starring his younger brother Tony (who would also go on to direct in Hollywood), the film follows the eponymous 'boy' as he plays truant from school and cycles around his northern seaside home. The stream of consciousness voice-over, partly inspired by James Joyce's Ulysses (1922), reveals the teenager's frustrations with the authority figures in his life but can, at times, be hard to follow. It is, therefore, the boy's physical journey and the locations he visits over the course of the day that provide the film's main structure. Strong visual imagery - the desolate beach, the abandoned fairground - and an evocative soundtrack add texture to this charming short film. What have this month's teachers made of it? Don't forget to have a look at previous months' Show and Tell, which include two lyrical British Transport Films' productions, Terminus (1961) and Snow (1969).